In Chapter 40, KRSNA Book, Krsna kills a washerman for being a servant of Kamsa and not providing clothing for him and Balarama. It seems to the group this killing was very out of character for Krsna and it made some of the group feel as if he was killing him because he was refusing to be in service to the lord. My group thought this was unfair considering he should not kill people just because they do not see him as the lord. The way I saw it, but was not helpful to my group, was that this is just another way of us seeing that Krsna is not the same as we are as humans. He takes human form but is far greater than his body. I felt as if this was a way of showing how Krsna embodies fully the six opulences. It is beyond our comprehension possibly? While Kṛṣṇa and Balarāma were passing in this way, They saw a washerman and dyer of clothing. Kṛṣṇa was pleased to ask him for some nice clothing. He also promised that if the washerman would deliver the nicest dyed cloth to Him, he would be very happy, and all good fortune would be his. Kṛṣṇa was neither beggar nor was He in need of clothing, but by this request He indicated that everyone should be ready to offer Kṛṣṇa whatever He wants. That is the purpose of Kṛṣṇa consciousness. On hearing this, Lord Kṛṣṇa, the son of Devakī, became very angry at the washerman, and striking him with the upper portion of His hand, He separated the man’s head from his body. The washerman fell down dead on the ground. In this way Lord Kṛṣṇa confirmed the statement that every limb of His body is capable of doing everything He likes. Without a sword, but simply with His hand, He cut off the head of the washerman. This is proof that the Supreme Lord is omnipotent. If He wants to do something, He can do it without extraneous help. Here is an article that may shed some light on your insightful question. 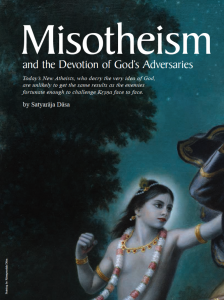 Misotheism and the Devotion of God’s Adversaries by Steven J. Rosen (Satyaraja dasa). As someone who works in the field of international law, I find Satyaraja’s explanations only partially satisfying. His article leaves several key issues unresolved. There may be legal justification for some kinds of killing—if your life is threatened you have to right to defend yourself—but it’s awkward defending Krishna’s slaying of a washerman for refusing to give him clothes. The catch-all explanation—“It’s just God’s lila, He likes to fight”—doesn’t do much for attracting people whose conception of a better life is one of reasonable and restrained justice. Given the option of reformation or non-lethal retribution, why kill? Still, you make a good point. Krishna is indeed not “like us,” and there are realities even closer to home that elude rational explanation. Why do animals have to kill to eat? Why is birth so painful? Why are the sufferings humans put one another through so extreme? There are anomalies even in the world we are familiar with that suggest reality will never conform to our idea of what is reasonable or just. So what to do? 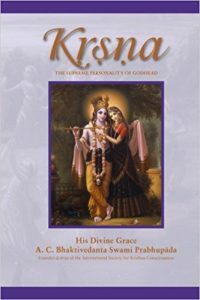 My own preference is to think there are hidden dimensions to Krishna’s reality that resolve such matters. For example, in the washerman story, there is an indication that the washerman suffered from his servitude to Kamsa. He says, “I have practical experience of this fact. Anyone who unlawfully wants to use the King’s property is very severely punished.” We have only a few dozen volumes of the Srimad Bhagavatam. In other creations, there were thousands of volumes. It may be that further detail concerning how the washerman suffered would lend insight into Krishna’s actions. There are many instances of such sacrifice to avoid intolerable suffering. In 73 CE, the 960 Jews on Mount Masada chose to kill each other—mass suicide—over capture and torture by the Roman army, to give only one example. But that kind of a parallel is pure speculation on my part. Thank you so very much. This is incredibly helpful. I find your explanation very helpful and really try to keep my mind from distinguishing Krishna as an equal human, others really struggle with this I see. It is especially hard for some, when reading beautiful stories like in the KRSNA book, because you become so entranced by the play. My teacher did offer he felt that there was some sort of past with the washerman that was not included in this particular story, however he could not make a conclusion. The one student is particularly frustrated with how it describes Krishna as becoming angry and then killing the washerman. I guess she feels that Krishna should not engage in killing acts out of rage. She was identifying his anger as coming from frustration that the washerman was not Krishna conscious. But again this “anger” is different than maybe our human anger is and is far beyond our comprehension so we use words to describe it which then leaves it open for people to become attached to the act itself rather than the greater picture of all of Krishna’s lila. I hope that all makes sense. Over the course of a few weeks now we have been revisiting this topic with different perspectives of those we talk about it with and it is just so wonderful to me that we have this opportunity. I thank you again for providing your insight, it is extremely valuable. Have a question for Joshua? Send an email to joshua@strmedia.com or post it in our Facebook Discussion Group.